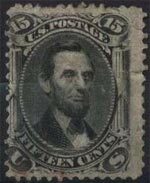 The stamp was cleaned with a new cancel added, then found a new life on the RIGHT. THIS SAYS nothing.............................. Take a look at the scan. What you see is what you get. This is a handed down collection comprising of (sic) over 20 boxes. Whenever there are notations on the envelopes they will be given. 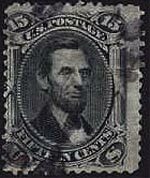 Some stamps have notations on the back. Wether (sic) these notations are correct or not is your obligation to determine.